User configured notifications are messages sent by email to any valid email address. Notifications apply to a particular Process, and specifically, to a particular Activity of a Process, and can include any of the business information implemented in the case. The message contents and sending requirements are entirely defined during the Process development. User Configured messages are created in the Activity Actions menu in the fourth step of the Process Wizard and are called E-Mails. They can be sent when an Activity is created, saved, or exited (On Enter, On Save or On Exit action). 1. On the fourth step of the Process Wizard select Activity Actions. A new window will display the Process diagram. 2. Select the Activity in the Process where the e-mail will be configured. In the Activity Actions Window click the Plus symbol on the bottom left corner and select the e-mail option. 3. The following window will be displayed in order to enter the required information. 4. Select the addressees: Click the To button. You can send the e-mail to a constant account, or you can select an attribute in your data model where an email address is saved. •To send to one or more constant accounts, select the Send e-mail to a constant account option, and type each address separated by a semi-colon. •Otherwise, mark the Send e-Mail to an account from data model selection option and select the attribute(s) from the data model displayed on the left. 5. Type a subject and the content. The e-Mail Definition Window is divided in two main groups: Ribbon and Message. Allows you to navigate the data model until you reach the desired attribute. For more information, refer to Include Process and case information. Allows you to add hyperlinks to the email. For more information, refer to Include Hyperlinks. Allows you to add tables with a fixed number of columns and rows. For more information, refer to Include Tables or collections. Allows you to include information returned by a rule. For more information, refer to Include information returned by a rule. Allows you to include tables to display the information stored in collections, or one-to-many relationships, that are displayed in the Work Portal as Tables. For more information, refer to Include Tables or collections. Allows you to include one image in the email. Shows or Hides the from field. This field allows you to set the sender's email displayed. You can set a constant account, or you can select an attribute in your data model where an email address is saved. Keep in mind that this option lets you send emails from any email address. Use this feature carefully since this may provide some security issues, send the email to the SPAM folder or not send the email at all. Testing this functionality before using it in a Production environment is strongly recommended. Erases the last action done in the message. Reverses the last undone action. Aligns the message content with the left margin. Aligns the message content with the right margin. Makes the selected text bold. Moves a paragraph farther away from the margin. Moves a paragraph closer to the margin. Sends a copy of the email to the current assignee of the task. 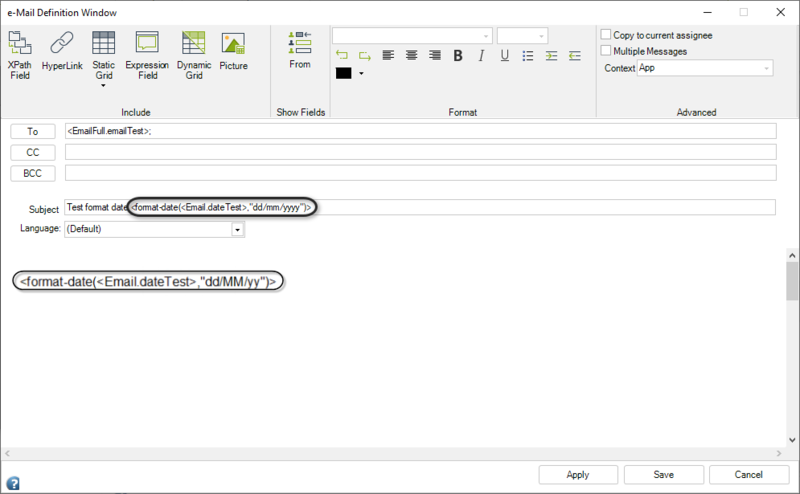 Enables to option to create tabs above the Subject field where you can create templates and send many messages subject to a condition. For more information, refer to Send messages according to conditions. This options is displayed when the Multiple Messages checkbox is marked and opens a window to define different Boolean conditions in order to identify which e-mail will be sent. Changes the context of the template according to the To field. For more information, refer to Context changes in E-Mails. Select the addressees to which the email will be sent. Select the addressees to which the email will be copied. Select the addressees to which the email will be blind-carbon-copied. Select the Subject for the message to be sent. Select the body for the message to be sent. Bizagi allows you to define different formats for the dates sent over emails, including the actual date and even the time values. This can be done on the Subject and the Message Body. To format a date, it must be stored in the data model, this way you need to select the Xpath to the date and select the desired the format. To format a date in a notification, include the function: <format-date(<Xpath>,"format")> on the Message Body and/or Subject field. •Only the mentioned formats are supported by the application. •Date formats cannot be used on Dynamic grids configuration. •Xpath attribute must be a Date - time attribute.